With the Water Power Joint, a patented water vitaliser and chalk transformer, water regains its original information from its natural source. 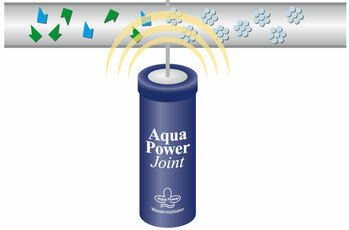 With the Aqua Power Joint, anoptimal energising of the water is achieved. The functioning of the device was tested by doctors and scientists from Austrian universities in long-term studies (BOKU Wien, Karl-Franzens-Universität Graz). 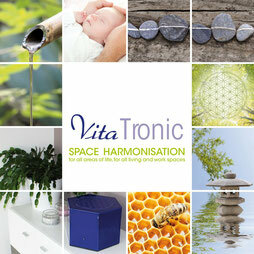 The results demonstrate a clear improvement of the bodily states of humans and animals, as well as plants. With the Aqua Power Joint, you have a natural spring at home, in the garden, biotope, swimming pool and in all areas where peopleanimals and plants need healthy water. 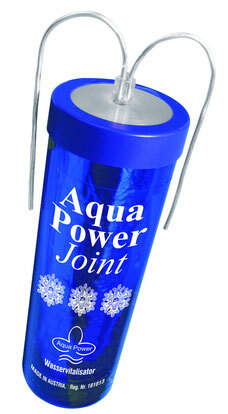 The Aqua Power Joint creates a permanent and constantly renewing energy whirl with healing information, through the combination of dia-, para-, and ferromagnetism. This is achieved by 999 pure silver suspension incorporated into the device, built onto the water pipes, transmitting it to the water as it ows through it. Pure silver, gold and platinum resonate with water molecules. It has a naturally prophylactic and protective effect, by strengthening the immune system. A special coloured light spectral lense with genial 7,5 x 1014 HZ (from the cloured light spectrum) for the natural conservation and refinement of healing energies protects from harmful in uences such as electrosmog, earth rays, etc. 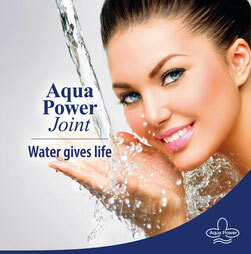 In addition, all the minerals, trace elements and crystals required by the human body are in the Aqua Power Joint. The Aqua Power Joint is entirely handmade, generates over 40,000 healing energy frequencies from bio-resonance and Schumann frequencies and activates all body energies. 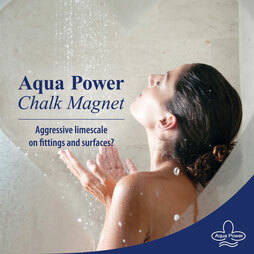 Aqua Power Joint energised water boosts the effects of Bach owers, Schüssler salts and the entire homeopathic range.